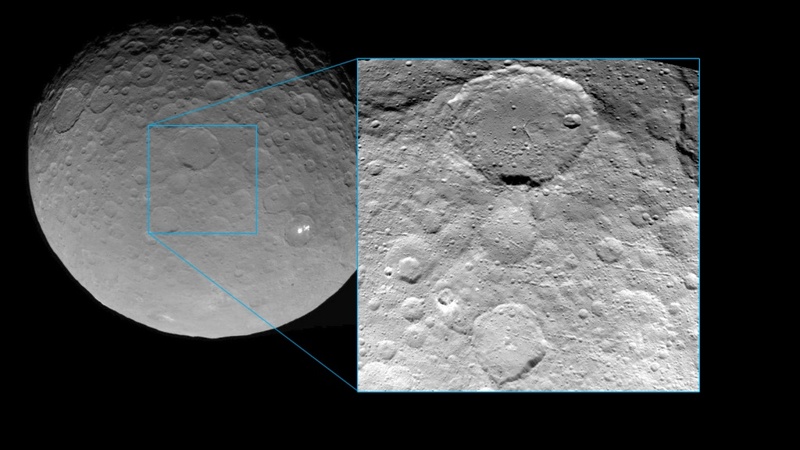 NASA’s Dawn spacecraft is getting progressively closer to the dwarf planet Ceres, as the latest image shows. Dawn’s camera — OpNav9 — captured the new image when the probe was just 3,200 miles (5,100 kilometers) from Ceres’ surface. The photo’s resolution is 1,600 feet per pixel resolution (two times higher than that previously obtained). The view shows numerous secondary craters, formed by the re-impact of debris strewn from larger impact sites. Smaller surface details like this are becoming visible with increasing clarity as Dawn spirals lower in its campaign to map Ceres. The region shown here is located between 13 degrees and 51 degrees north latitude and 182 degrees and 228 degrees east longitude. The image has been projected onto a globe of Ceres, which accounts for the small notch of black at upper right. 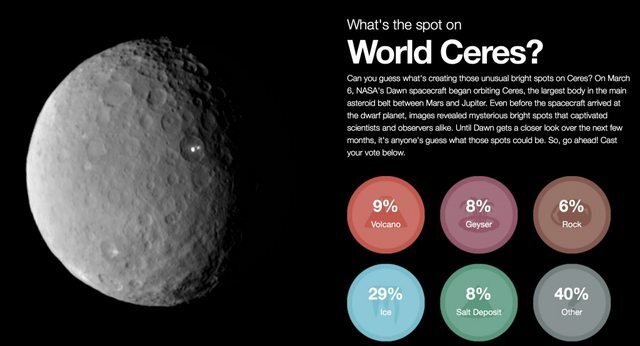 Ceres, the largest object in the asteroid belt between the orbits of Mars and Jupiter. According to Dawn’s top scientists, more details will become visible on the surface of the dwarf planet as the proble will spiraling down to a 2,700-mile-high (4,400 km) orbit, which it should reach on June 3. A screenshot of NASA’s page for voting on what those spots on Ceres are. © NASA/JPL.